Shipping: **Free Shipping** This product now has FREE SHIPPING. The price you see may seem higher but, it is the same as last year, or less, with shipping built in. This is our standard Fantasy Football Draft Kit which includes a draft board and the complete set of pre-printed, color coded, 1 X 4 inch NFL player labels. The labels include the player's name, position, bye week and team. We don't include goofy things like pictures or logos which only take up space on the label, and make the text smaller! This fantasy football Draft Kit comes with your choice of a 8, 10, 12, or 16 team draft board and with your choice of either standard or auction format labels. Included for free is our Draft Board Personalizing Kit which has labels for your League Name, and Team Names, which are easy to print out using our online templates. 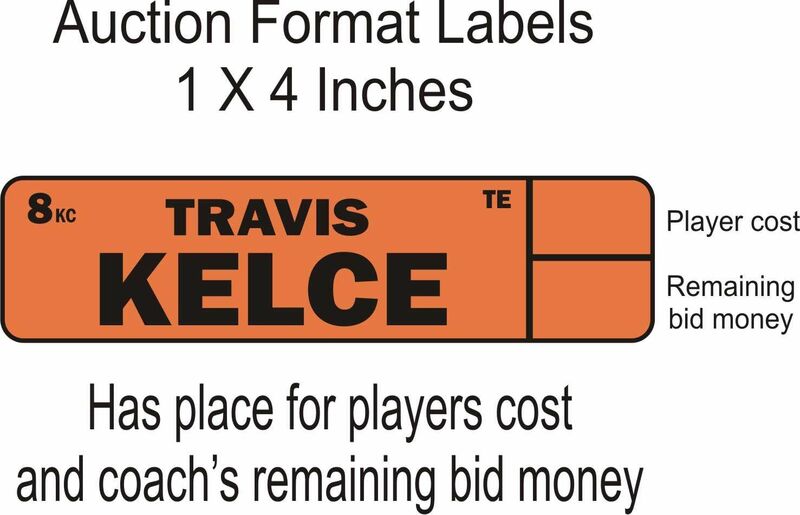 The auction format kits also include Draft Board Position Labels that you can print out and convert your draft board to a position based draft. Auction kits are $1 extra. You can add a draft board stand, defensive players, extra team names, or extra grid if your league has more than 16 teams. Make sure to fill out all options so you get the kit you want. If you are ordering more than one Draft Kit in a different style, size or with different options, add this item to your cart separately for each different configuration you need. If you need wholesale pricing for a large order, Please click here or call us. Standard shipping is by Priority Mail which takes 2-3 days but is not guaranteed. Because of this we allow up to 1 week for delivery. It is so nice to be able to talk to a real person and ask questions. Love dealing with a real business with real people, not just a web page with no phone or even worse, Amazon with people in India who know nothing. Hi guys, everything was great as usual. Thanks again. This board is great and easy. We have 10 years worth of boards and enjoy pulling them out each year to see how right, or wrong, we were. You can stick on the wall or buy the draft board. We've done both but use the wall, primarily because of space. My League has been using this draft board for years. The re-order is easy!